It’s January and everyone is feeling a bit guilty about dumping their resolutions. Can you eat good food without self-loathing? Yes, these are the best side dish, and so easy to make. Just poke a few holes in each one, and place on a foiled lined baking sheet, and put in a 400 F oven for 45 minutes. I sprinkle a bit of cinnamon sugar, and a small pat of butter, just like Ted’s Montana Grill. I suggest you make a few for tonight. They are delicious and really good for you. Enjoy! Posted in baking, Cinnamon, vegetable and tagged sweet potato, Ted's Montana Grill. Bookmark the permalink. you’re so right–perfect! Great photo. Love the colors and the butter pat. Thanks Liz, I will be making these often since they are so yummy! 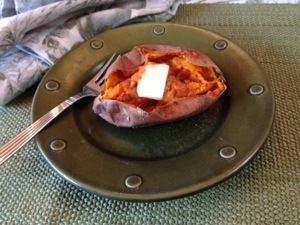 I love sweet potatoes! Here’s my favorite way to make them too. Super easy, super delicious! and customizable with toppings as always!